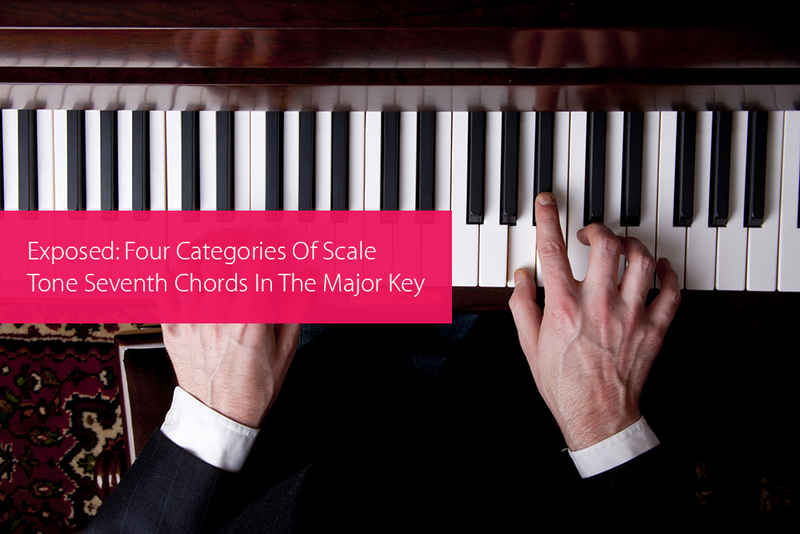 There are four categories of scale tone seventh chords in the major key. The goal of this lesson is to narrow your perspective down to these four chord categories versus knowing and memorizing seven different chords in every key. One of the advantages of knowing these four categories is that it would help you understand how chord-based idea substitution in the major key works and also how to derive scale tone chords simply by assigning chord quality to a particular tone of the scale. Due to the fact that the chord of the first scale tone is a major seventh chord, we can assign the major seventh chord quality to every other 1-chord. …which is the 1-chord in the key of F major. Trust me! You’ll understand this better in the second segment of this lesson. For now, let’s get started by refreshing our minds on the scale tone chords in the major key. There are two key types: the major key and the minor key. From the outline above, there are four chord types in the major key: the major chord, the minor chord, the dominant chord, and the diminished chord. Let’s categorize scale tone chords according to these chord types. …are the major chords in the major key. Attention: The 5-chord is also a major chord. However, it is classified as the dominant chord in the major key. So, there are two major chords in every major key: the 1-chord and the 4-chord. Following the same procedure, the major chords in any major key can be determined. The 6-chord, 2-chord, and 3-chord in the major key have the same chord quality — the minor chord quality. …are the minor chords in the major key. So, in every major key, there are only three minor chords: the 2-chord, 3-chord, and the 6-chord. If you stick to the procedures, you can derive the minor chords in any given major key. The chord of the fifth tone of the scale is the 5-chord and the technical name for the fifth tone of the scale is the dominant. So, the dominant chord in the major key is simply the 5-chord. is the dominant chord in the major key. If you stick to the procedures, you can derive the dominant chord in any given major key. The diminished chord is the chord of the seventh tone (aka – “the 7-chord”) in the major key. The specific chord quality assigned to the 7-chord is half-diminished seventh chord. …is the diminished chord in the major key. If you stick to the procedures, you can derive the diminished chord in any given major key. Using the categories of chords learned in this lesson as a reference, scale degree chords in every major key can be mastered. In a subsequent lesson, we’ll go a step further into exploring the categories of chords in the minor key. Our skill set will be enhanced. Thank you GMTC for strengthening us.